While looking through the box of Downtown Club flyers in Fales, I was originally looking for a flyer that was visually appealing. I have very little knowledge of the Downtown club scene in the 70s and 80s, so I was open to any flyer that caught my eye. The first flyer that caught my eye was a black and white flyer that had a comic-like box in the left hand corner and big comic-esque writing that read “Huge Killer Ship” colored in red, orange and yellow. 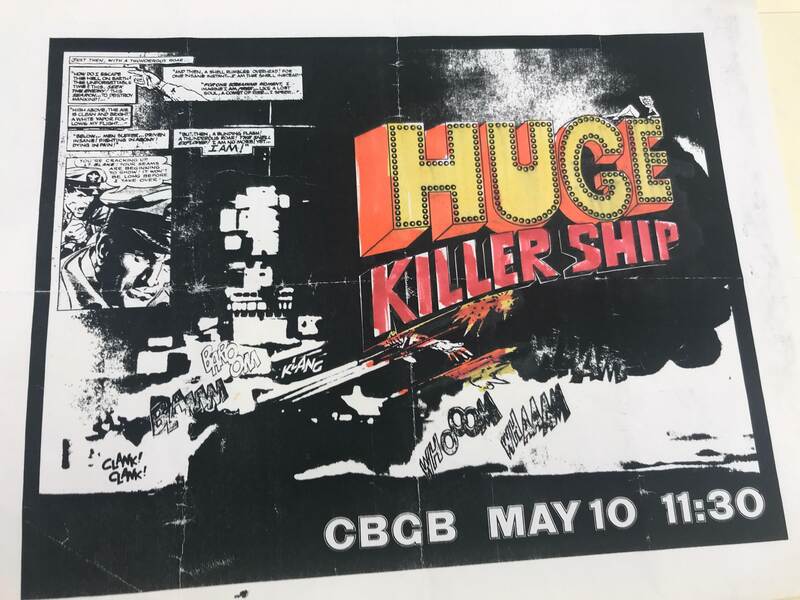 This “Huge Killer Ship” was what I assumed to be a band, and they were going to be playing on May 10th at the club CBGB. This flyer immediately seemed interesting to me, we had talked about CBGB in class before, and the comic-style aesthetic was interesting and different. 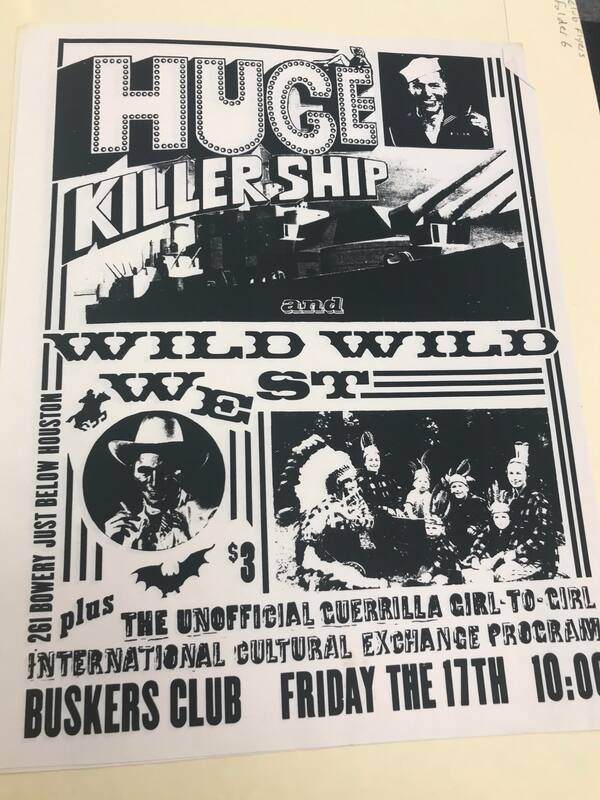 The next folder had a flyer also for a performance of the band “Huge Killer Ship”, along with a show “Wild Wild West”, but this time at the Buskers Club on Friday the 17th. Two flyers from two separate clubs both advertising the same show or band inspired me to research more into these clubs, this band or show, and the club scene in general. I first wanted to research more into “Huge Killer Ship”, something to proved to be more difficult than I originally thought. A google search of Huge Killer Ship left me with news stories about cruise ships crashing and not much more. Only after adding “1980s” and “NYC” in the search bar did I find some results. Mostly though the information I could find was from blogs that were focused on NYC bands of the 1980s or about the history of New York. One blog, called the Ephemeral New York, seemed to be doing what we aim to do through this project, “Chronicling an ever-changing city through faded and forgotten artifacts.” This blog had posted a whole page about clubs on the Bowery in the 80s, and referred to the second flyer I had looked at for the Buskers Club. This blog referred to the Buskers Club as a short lived rock club that closed in 1983. This blog post was also plagued by the same lack of information I was, even asking “Does anyone know what happened to…Huge Killer Ship?” The other blog I found was posting about a band called Honeymoon Killers, another band that played in Downtown clubs during the 80s. The post chronicled the projects of the band member Jerry Teel, who also happened to play guitar for Huge Killer Ship. Armed with the knowledge that Huge Killer Ship was indeed a band, but not being able to find much else, I turned to examine the club scene in which this band played in. The club scene of Downtown Manhattan really began to take form in the 1970s when the rest of Manhattan was not doing as well, “It [the 70s] was an unsettling time to be living in Manhattan: the economy was in the gutter, crime rates were high, and prostitutes and junkies lined the streets. But beneath the challenges of the harsh realities the city faced above the ground, there existed communities of booming musical creation and artistic expression.” (Scancarelli, 2016). Musical invention and creativity wasn’t new to Manhattan, but this coupled with an outpouring of other forms of artistry, such as art and writing, led to the Downtown art scene to turn into an” avalanche” continuously “gain[ing] momentum.” (Scancarelli, 2016). This overflow of art, concentrated in Downtown Manhattan, found it’s home in the same clubs the flyers I looked at were advertising for, such as CBGB. The club originally called Hilly’s on the Bowery would become CBGB in 1973. This club, located at 315 Bowery, is “widely regarded as the birthplace of New York City punk rock culture” and stood for “Country, Bluegrass, Blues”. (Scancarelli, 2016) This club featured legendary musicians such as the Ramones, Blondie and many other punk or rock musicians who helped shape the musical landscape of the time, including the lesser known Huge Killer Ship. CBGB closed in 2006 after they were no longer able to pay their rent, and is now a John Varvatos boutique. A perfect example of the ever-changing landscape of Downtown Manhattan.This area had gone from the slums, to a place for the artistic counter-culture of the 70s and 80s, to now an up and coming trendy and expensive area. The Buskers Club, similar to the band Huge Killer Ship, is a more obscure feature of the 80s club scene, only appearing in a interview the Gothamist did with Sante. Sante discussed going to the Buskers Club one night, “We all first visited the Bowery to go to CBGB, of course, and in the early ’80s there was another youth-culture outlet, the International Buskers Club, in a basement just south of Houston.” (Priluck, 2007) It seems that these clubs had more linking them together than a same band playing at both venues, it seems that they had a similar clientele as well. This seems to be pretty typical of the Downtown Club scene of the late 70s and early 80s, it attracted a specific type of person. The people were attracted to specific music, art, culture that was attached to these clubs, but they also had to be willing to put up with the darker sides of Manhattan, and these clubs, at this time. Clubs during this time were often faced with the same perils as New York in general was. The late 70s into the early 80s was a time when “the city was edgy and dangerous, when women carried Mace in their purses, when even men asked the taxi driver to wait until they’d crossed the 15 feet to the front door of their building, when a blackout plunged whole neighborhoods into frantic looting, when subway cars were covered with graffiti…” (White, 2015) It was a time when Heroin and other drug use was commonplace in the clubs and artistic harems of Downtown. So then, why is this time period one that has recently become the subject of a large amount of romanticism in contemporary times? This time period is a specific one, the five years that cover the late 70s to early 80s, 1977 to 1982. The art world and the club scenes of this time have been featured in the HBO show Vinyl, in novels such as “The Flamethrowers” by Rachel Kushner, and exhibits in the Whitey displaying the work of David Wojnarowicz the “ultimate East Village grunge artist.” (White, 2015) Why is this dark and dangerous world suddenly so tantalizing to a mass consumer? It could be that this was a time of more pure art, free of commodification. A time in which artists still wanted to be “martyrs to art” and were worried about how it would long to make deals with Hollywood or Wall Street. The world of culture was smaller, and because of this more interwoven. Artists, musicians, writers, club owners, were all making culture and art together. This led to a little cosmos of Manhattan having a lasting influence on American culture, “These years held the origins of the Downtown Scene, a multidisciplinary, simultaneous movement that was headquartered in the East Village and was characterized by the birth of punk music” (White, 2015) It was here that CBGB helped jumpstart punk rock and the careers of musicians such as Television and Patti Smith. It was here that the flourishing art world and club scene could come together and make something special, something that would cancel out all the crime and drugs. The two flyers that I chose from the Fales Collection show this nature of the Downtown club scene in NYC during the late 70s and 80s. They give us an insight into this unique culture. These flyers were an artistic expression, but they were also an interesting way to draw people into shows and clubs. In this way these flyers can reveal a lot about the club scene at this time and in this space. This scene wasn’t just for drugs and rock n’roll, it was also a place of an artistic renaissance. But, these flyers can also reveal a lot about the changing landscape of Downtown New York. It had transitioned from the Bowery Boys of the 1800s, to an escape for the Punk Scene and the LGBTQ community in the 1970s and 80s to now being trendy places for wealthy people to shop. These clubs were a haven for counter-culture, just as Downtown Manhattan often was. This area might have changed from the 1800s to the late 1900s, but until recently, it was a haven for the different, the poor, and the downtrodden. “A Couple of Clubs on the Bowery in 1983.” Ephemeral New York, 15 Sept. 2010, ephemeralnewyork.wordpress.com/2010/09/15/a-couple-of-clubs-on-the-bowery-in-1983/. “Honeymoon Killers.” Nothin’ Sez Somethin’, 19 Nov. 2008,nathannothinsez.blogspot.com/2008/11/honeymoon-killers.html. Peterson, Morgan. “#TheLIST: New York’s Most Historic Night Clubs.” Harper’s BAZAAR, Harper’s BAZAAR, 4 Oct. 2017, www.harpersbazaar.com/culture/features/g6051/historic-new-york-city-nightclubs/. Priluck, Jill. “The Old Bowery: Dancing Bums & Moishe’s Egg Cream.” Gothamist, 26 Feb. 2007, gothamist.com/2007/02/26/with_the_bowery.php. Scancarelli, Derek. “Highlighting the Iconic New York City Music Venues of the 70s.” Noisey, 11 Feb. 2016, noisey.vice.com/en_us/article/rmjwvq/highlighting-the-iconic-new-york-music-venues-of-the-70s. White, Edmund. “Why Can’t We Stop Talking About New York in the Late 1970s?” The New York Times, The New York Times, 10 Sept. 2015, www.nytimes.com/2015/09/10/t-magazine/1970s-new-york-history.html.